Today launches a brand new series on KELLEYNAN.com – inspired by you and brain-childed (I think I just made that word up haha) by that Mama Nan ;). Having featured mostly tables and meals for six+, I’ve received several requests for different types of table settings and ideas. What about more casual? 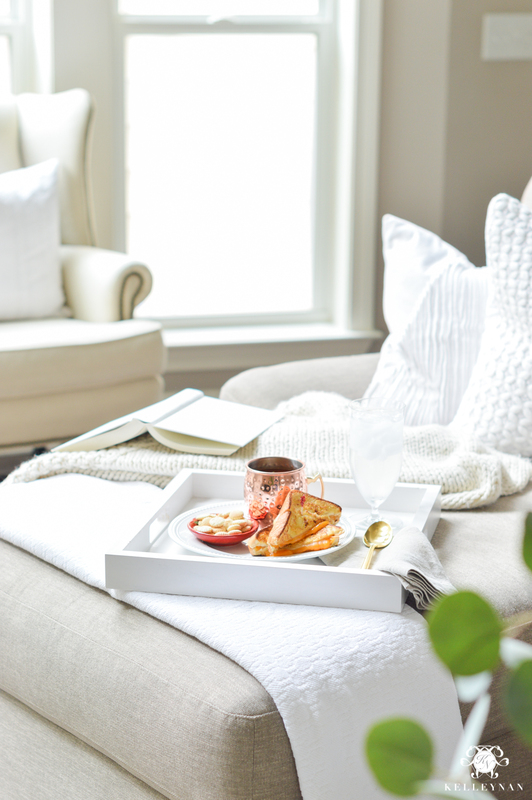 What if you’re hosting your boss? What if there are three of you? What makes the most sense while still maintaining a nicely “hosted” atmosphere? Enter the brand new series, Dining by the Numbers. Each post in the series will have a number-appropriate (in order 😉 ) theme, covering vastly different dining and entertaining situations. Some will be centered around recipes, others- activities, table tips and hosting ideas. Starting at the beginning, first up in Dining by the Numbers: Flying Solo. Let’s be honest. how many of you eat at a table every night? I know there are those of you who do (I commend you!) but especially on nights where I eat alone, you can most likely find me perched on a bar stool, or eating dinner, lounged on the sofa. Ok, that’s actually not uncommon, even when I’m not eating alone ;). On the most simple side of the spectrum, we have real, everyday life. Maybe you eat alone often or maybe only occasionally but I know the struggle of getting yourself fed, maybe even more so when you don’t have to worry about feeding an entire family. Not wanting to dirty the dishes or having less motivation to cook can send you straight for the cereal (and that’s totally ok in our house, on occasion). But, to really enjoy it, there are two (still simple) ways I like to prepare dinner for one. In the south, we live, eat, and breathe casseroles. Especially when I lived alone, I loved to prepare a favorite on Sunday and eat on in throughout the week. Delicious and inexpensive. You can even prepare two at once and freeze one for later; as an extra bonus, you can take leftovers for lunch. 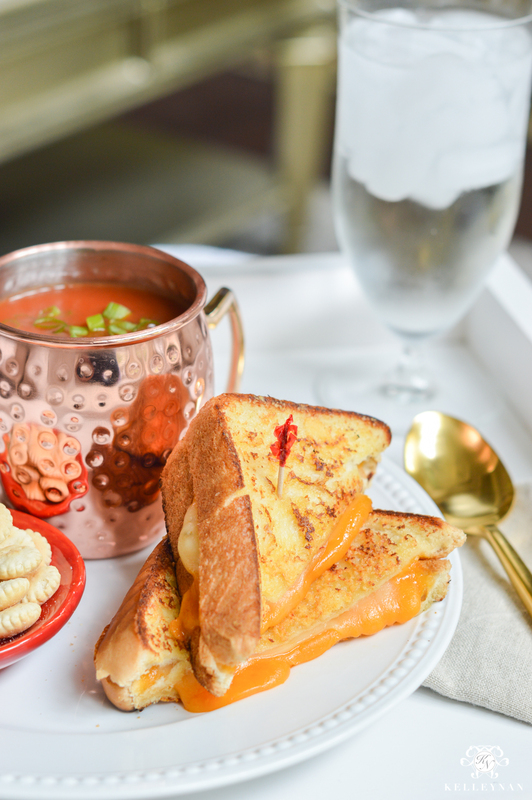 But, if you aren’t in the mood to really cook or eating alone is more rare of an occasion, one of my favs is the classic comfort food- grilled cheese and tomato soup. There’s nothing revolutionary about that combo, but y’all, there’s a reason the pairing has stood the test of time. I do, however, have two tips to elevate that infamous can of Campbell’s (which I still believe is the best) and make that grilled cheese just a little more gourmet. 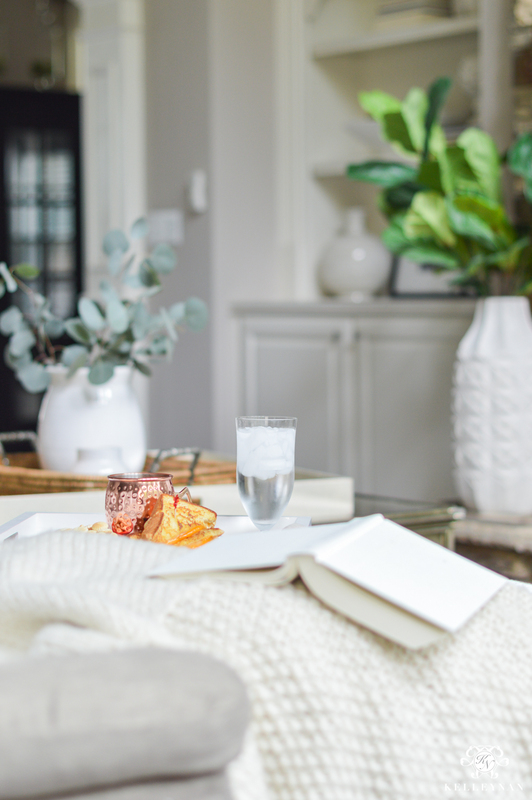 If you don’t have a simple tray, I love this one – it comes in several colors and I use it all over the house. When Dave first made me a grilled cheese, it blew my mind. Beyond using something other than Kraft American singles I couldn’t pinpoint what made it so different. Here it is. If you’ve never tried it before, put it on your list. After you butter the outside of your bread (PS: I always butter the bread instead of the pan), sprinkle it with parmesan cheese. It turns into a buttery, parmesan crusted sammy that is unmatched. Do you have a go-to cheese? One of my favs is a combo of pepper-jack and sharp cheddar. Lastly, if you want a more fluffy, plumped up grilled cheese, find the Texas Toast in the bread aisle ;). For the soup, I really hope you love Campbell’s original. Yes, I know about the variety of tomato soups out there with more sophisticated flavor profiles but this will forever be a fav. I learned this little tip from Mama Nan years ago- after you pour your soup, add a little dash of Worcestershire and top with diced scallions. Just. Do. It. And, especially if you are cozying up sans sammy, pour your soup in a mug- tomato soup is so thin, you can use a spoon or drink straight from the mug. 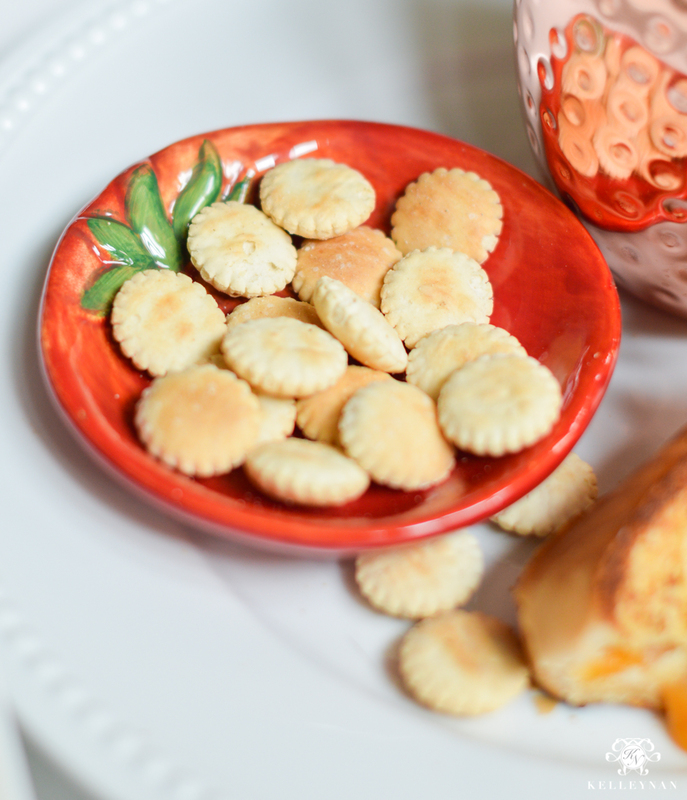 We also tend to gravitate toward those cute little oyster crackers in our house. I sprinkle them in as I go along so they don’t get too soggy. Do you have a killer grilled cheese? Let me know your go-to in the comment section below. How do you dine when you’re alone? I love Chinese takeout as much as the next person but save the $20+ dollars and re-visit this classic go-to next time you have a night in with yourself. See all living room sources HERE. Always a classic. I grew up loving this simple combo. Been a bit more challenging now that we are gluten and dairy free, but it CAN be done. 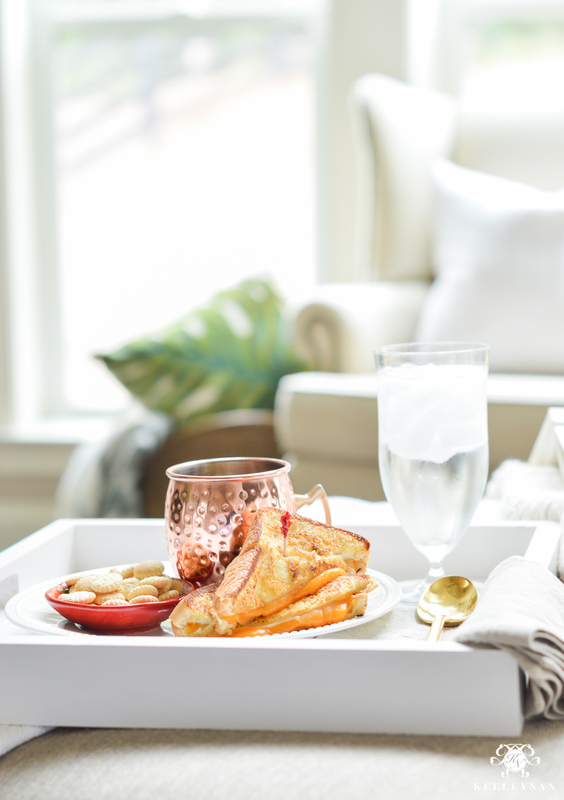 Love the use of the moscow mule mug! Oh, I feel for you! They are coming out with great gluten free alternatives all the time now but I’m sure no cheese is especially tough! Love your “Dining by the Numbers”. 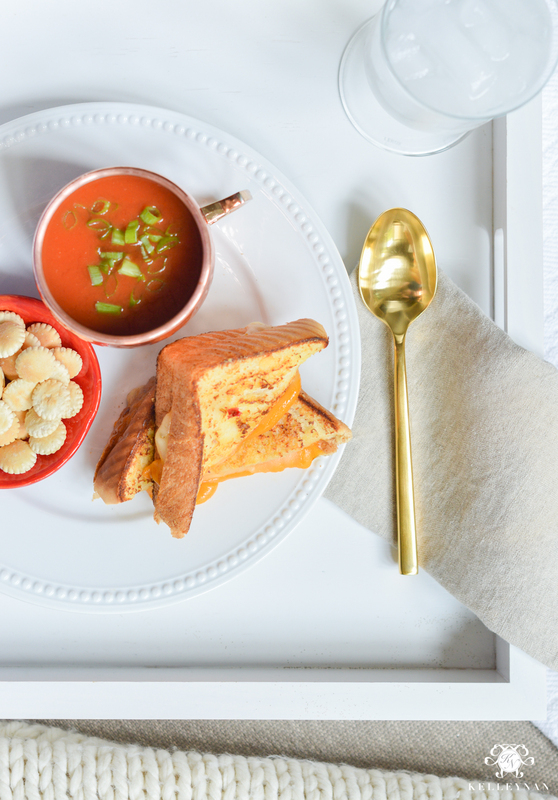 Who doesn’t love grilled cheese and tomato soup. I had it yesterday. Campbell’s original is my favorite also, and to make it just a bit more creamy, I make it with half milk and half water instead of all water. Best grilled cheese I have had is made by sprinkling Red Robin seasoning on buttered side. Similar to Parmesan cheese you mentioned in post, flavor is sooo good. My 16 year old son started this variation on grilled cheese. 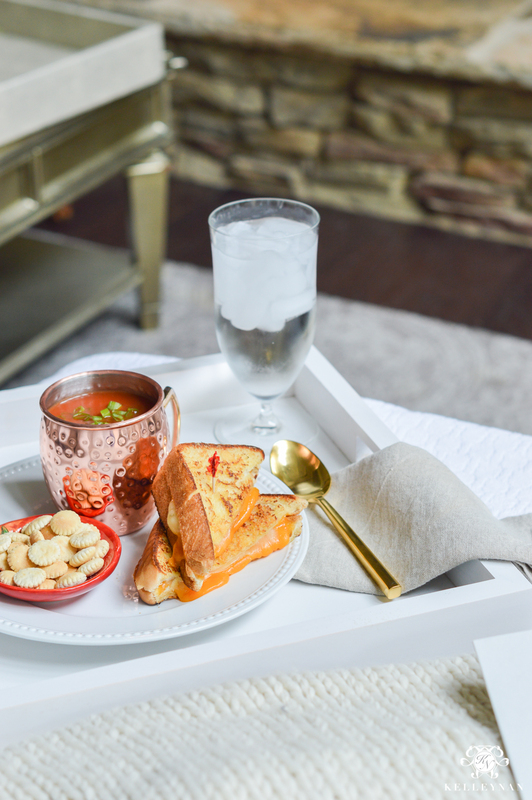 Your presentation of GC and tomato soup is perfection! OK, we are going to have grilled cheese for lunch tomorrow because I’m dying to try this parmesan cheese twist! Totally love this new series Kelley! Kris, did you try it yet?? Catherine, thank you! My mom used to do open face tomato and cheese in the oven with oregano sprinkled on it. Yum! So many people sound like they are on the mayo train! And chunky salsa- that sounds divine. I am so going to try that! Dave’s Grilled Cheese is a must try! Parmesan on just about anything is a plus! Love your Dining by the Numbers idea.! When my husband has to travel, I admit, I usually don’t bother for myself. Need to get out of that habit! Anne, you will have to let me know when you do! Ok so I know this sounds totally gross but I had a grilled cheese at a friends and it was the absolute best. So I asked my friend what she did differently and she said she “buttered” the bread with mayo. I don’t even like mayonnaise and I have to say it was so good so I’ve tried it at home and it was delicious! 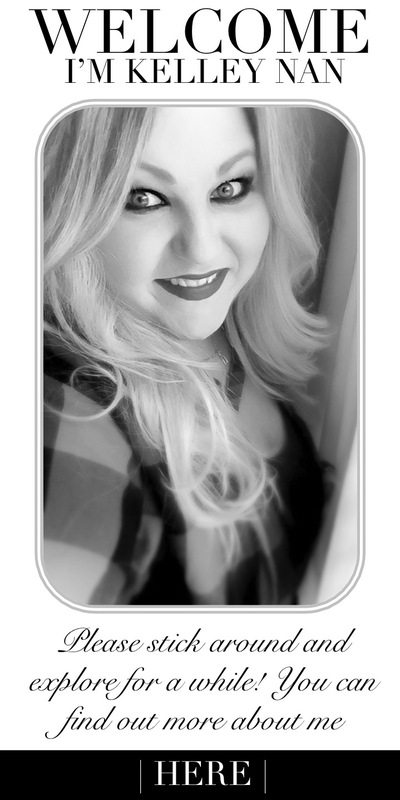 Just a thin swipe is all you need. In our house, we always add Spanish onion sliced really thin to the grill cheese! I learned this trick about a year ago and can’t have it any other way now! I love this series idea! The night of my wedding rehearsal, after all the festivities, it was late and all the restaurants/bars on 30A were closed… we headed back home for the night and my mom made a massive quantity of grilled cheese sandwiches for us 🙂 sometimes you really can’t beat simple. Lauren, that sounds just perfect. I attended a wedding one time and they served grilled cheese late night at the reception. So cute! I was a meatless eater for 32 years – can’t say vegetarian cuz I love love love all things dairy – and grilled cheese and tomato soup is a fav. I am all about the Campbell’s myself. However there are 2 new way to try it: But it’s fattening. Just warnin’ ya. For the soup: try half can of cream and half can of milk, a rounded tablespoon of curry and lots of pepper, and a small can of diced tomatoes in it. It’s beyond awesome. If you don’t have cream try milk but a dollop of real butter- it makes it so amazing. Also, try spreading cream cheese in with your cheese-of-choice for your grilled cheese. Oh my word. My favorite meal! We usually have one can original Tomato, one can of Tomato Bisque. Milk instead of water(or half water half milk). Dash of Tobasco or some Tony’s. Gives it jusssst enough kick! Can’t wait to try the parmesan! Yum! I have never thought of mixing the two, either! I am totally going to try the pepper jack and sharp cheddar!!! Who knew i could live past kraft singles?!? My tomato soup tip is a can of tomato soup then add some buttermilk and basil! Instant and delicious tomato basil soup!! Kat, yes!! And that sounds delish!! We always sprinkle lemon pepper on our tomatoe soup. It tastes great. Cindy, I never would have thought of that! Thank you for sharing! Great new series Kelley Nan! 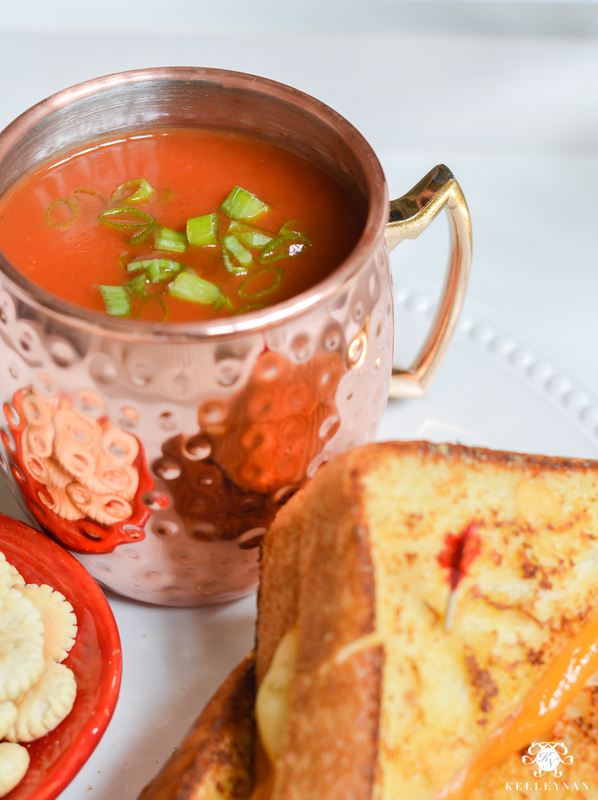 Now I’m hungry for grilled cheese – oh and I can’t forget the tomato soup! Can’t wait to see the next blog! Hugs! Hi, Pam! I never would have thought of that! It looks like it would have to be in contact with the copper for several hours, but the good news is that most any Moscow Mule mugs you buy will be coated/plated with a non-copper metal on the inside. Phew. Thank you for sharing! Oops retraction!! Although the Trivia is correct, the article I read recently warned about COPPER poisoning not lead from the Moscow Mule type Copper Mugs. The warning still stands in regards to using them for tomatoes however due to the acid. I’m excited to try the grilled cheese idea with my family!! Many thanks. I I am with you on the classic Campbell tomato soup…… You can’t beat it! Thanks for sharing your insight on your weekend getaway. I love to hear about the places you visit. Enjoy. Sounds like the perfect solo evening to me! 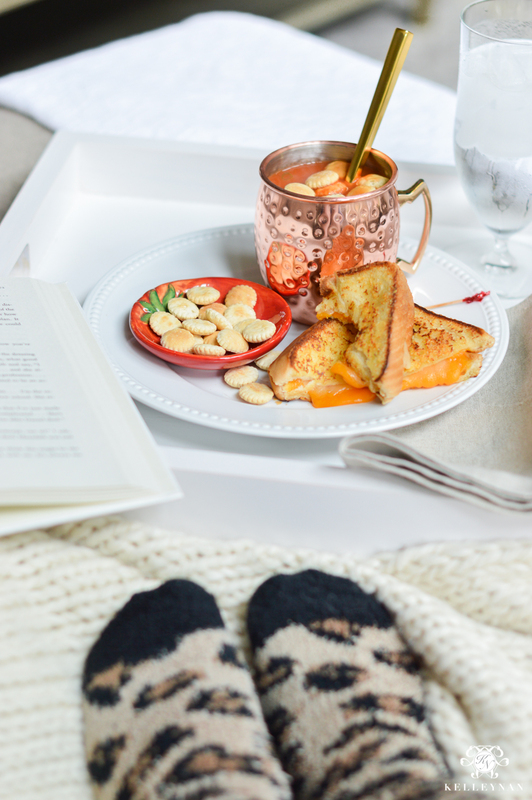 Can’t wait for cooler weather so I can snuggle on the sofa with soup and a good book! Brenna, with the cool fall weather on the way, it will be perfect! Ok, now I’m hungry! I’m going to have to try David’s GC sandwich and your mamas tomato soup! It all sounds so good!